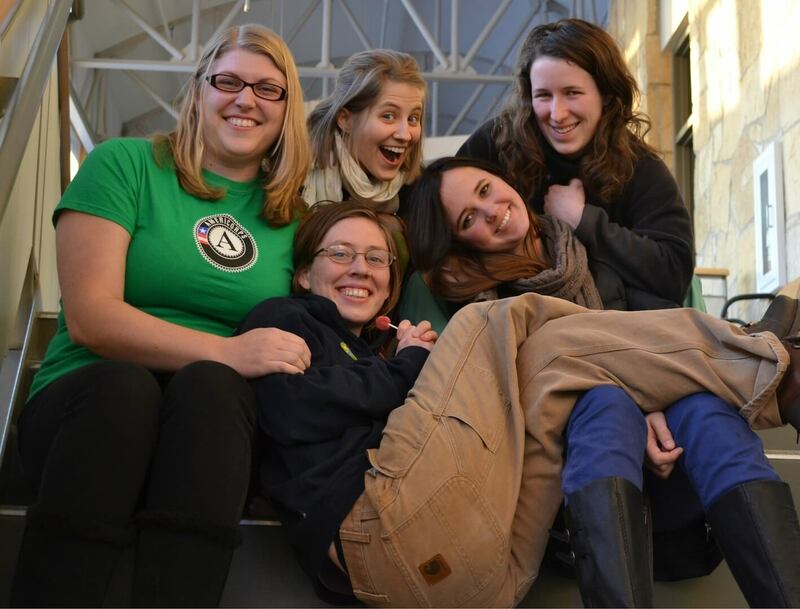 AmeriCorps and FoodCorps service members are referred to as Resource Contacts (RCs), both at our schools and in our office at Luther, where one part of the Food and Fitness Initiative is based. People often ask us what it is, exactly, that we do. Generally, the answer is something along the lines of, “We work with school districts to improve wellness, by teaching nutrition education, working with school gardens, encouraging physical activity, and working with School Wellness Teams and Food and Fitness Youth Teams to improve wellness policies and organize wellness events.” Though this is a good summary of our positions, it doesn’t quite capture the variety and depth of our work. RCs are constantly on the move, driving between our school districts and our offices at Luther, and working on so many different projects that sometimes it can be hard to keep them straight. To explain a little of what we do, I’d like to share a story from a few weeks ago that shows the interconnectedness, craziness, and hilarity that ensues from engaging 18 school districts in wellness. The Players: Elizabeth Makarewicz (RC for Postville, Valley, and Oelwein), Katie Lay (RC for Starmont, North Fayette, and West Central), Kayla Koether (RC for Clayton Ridge, MFL MarMac, and Central), Ashley Christensen (Safe Routes to School Liason), Ann Mansfield (Project Coordinator for Food and Fitness), Jon Jensen (Director of Sustainable Communities at Luther College) and Seed Savers Exchange. The Goal: To pick up free seed potatoes that were offerred to the RCs by Seed Savers Exchange (SSE), to be taken to our school gardens. On a Monday, at our weekly RC meeting, I asked if anyone was interested in taking Seed Savers up on their offer of free seed potatoes. Kayla and Elizabeth both said they’d be interested in getting potatoes for their schools. I called Seed Savers that afternoon to request 5 pound bags for each of the three of us. The man I talked to, Tom Walberg, was happy to set aside some potatoes for us and I told him I could be by that afternoon to pick them up. He asked if I knew anyone working at SSE who could bring them into town for me. It just so happens that Elizabeth’s roommate works at Seed Savers, so she was able to bring them into town with her that evening. Kayla lives near McGregor, and so by the time the potatoes made it to Decorah, she was already on her way to Clayton County. I knew I’d be down in West Union on Tuesday, where later that evening Food and Fitness was holding their Regional Leadership Council meeting, which Kayla planned to attend. I offered to leave a bag of potatoes there for her so she could take them home with her. For a brief moment, that seemed to be the end of the story. After I left West Union and returned to Decorah, I heard from Kayla that she had gotten delayed at one of her schools and wouldn’t be able to make it the meeting. I knew several other people from Decorah were at the meeting, so I began texting people in the hopes that someone would check their phone before hitting the road. Ashley was the first to respond, and she said that she’d bring the potatoes with her, and could deliver them to Kayla when she drove down to Clayton Ridge later that week. Again, I thought this might be the end to the story. While I was trying to get the potatoes out of West Union, Kayla and Elizabeth had been in touch. Elizabeth was driving to Postville on Wednesday, which was close enough for Kayla to pick them up before her garden planting Wednesday afternoon. Elizabeth gave Kayla the bag of potatoes that Elizabeth had originally planned to use, and those potatoes were planted by Kayla right away. 5 pounds of potatoes were successfully in the ground! However, when I came into the office Wednesday morning, there was a bit more confusion to be had. Ann Mansfield, one of the people I texted to help return the potatoes, was also at Luther that day. We started chatting, and she eventually asked me if I had gotten the potatoes from Jon. After seeing my text, Ann had suggested that Jon bring the potatoes back to Luther because we work out of the same office. At that point, Ashley had already volunteered to bring them back, so I’m sure Jon decided to let her take them, which Ann hadn’t realized. I, however, was not sure if Ashley had the potatoes, or if Jon did, and I still hadn’t realize that Kayla and Elizabeth had traded potatoes in Postville. Later that day, Ashley sent out an email to the three of us saying the extra bag was in her office, and I heard from Kayla that she had gotten potatoes from Elizabeth. I still had the bag I’d picked up for myself, and Kayla already had hers planted, so it was just up to Elizabeth to pick her potatoes up from Ashley. Now, weeks later, several school gardens have potatoes in the ground, including two of my schools, North Fayette and Starmont! Despite the very complicated trip the potatoes took, Kayla was the only one to drive out of her way, which, admittedly, wasn’t that far. Though the collaboration was a bit hectic, I think it shows how well we as RCs are able to work with community organizations, our partners within Food and Fitness, and each other to facilitate school wellness. It took a little time, and several phone calls, but we accomplished our goal. Hopefully this fall, our schools will enjoy a great harvest of potatoes! This entry was posted in North Fayette Valley CSD, School Wellness, Starmont CSD and tagged Gardens by Katie. Bookmark the permalink.